In the twenty-first-century world of juvenile justice policy and practice, nearly everyone agrees that one of the most pressing issues facing the nation’s juvenile courts is their proper response to delinquent youths with mental disorders. Recent research indicates that about two-thirds of adolescent offenders in juvenile justice facilities meet the criteria for one or more mental disorders. What are the obligations of our juvenile justice system, then, as the caretaker for delinquent youth with such disabilities? How do issues of adolescent development create special challenges in determining the court’s proper response to delinquents with special mental health needs? Thomas Grisso considers these questions while offering new information to assist the juvenile justice system in its responses to the needs of our children. 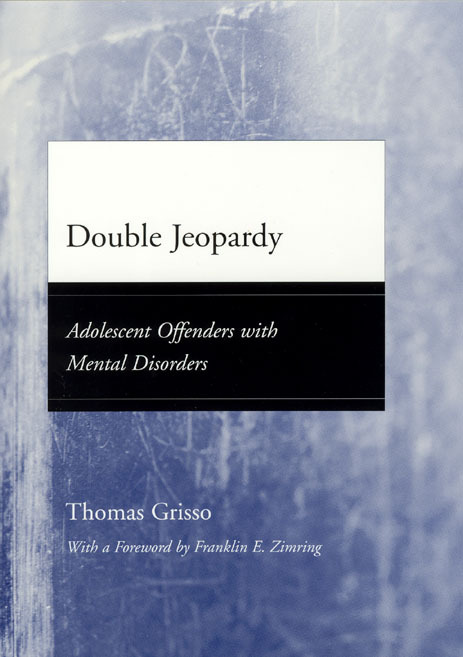 Double Jeopardy considers the newest data on the nature of youths’ mental disorders—their relationships to delinquency, the values and limits of methods to treat them, and the common patterns of adolescent offending. That information is used to chart a rational course for fulfilling the juvenile justice system’s duty—as a custodian of children in need of health care, as a legal system promoting fairness in youth adjudication, and as a protector of public safety—to respond to delinquent youths’ mental disorders. Moreover, Double Jeopardy provides a scientific yet practical foundation for lawmakers, judges, attorneys, and mental health care professionals, as well as researchers who must fill the knowledge gaps that limit the juvenile justice system’s abilities to meet youths’ mental health needs.